The Rio Olympics is just days away. But trying to find out what cultural events are planned in the city during the Games is difficult, as I discovered. Rio's Olympic organisers promised to follow London and organise a Cultural Olympiad - a series of arts events - organised around the Games. There's no information online and no official programme. And it is thought that up to 50% of the events originally planned around Olympics have been cut due to Brazil's economic crisis. Brazil is in economic meltdown and politics have been gridlocked since the impeachment of the left-wing President Dilma Rousseff. Her trial is scheduled to take place during the Games. One of the first acts of the new centre right government was to abolish the Ministry of Culture in the name of austerity. They later reinstated it after a huge public uproar - but not before hundreds of artists had occupied the ministry building in Rio, putting up tents in the atrium and turning the courtyard outside into a make-shift venue where they staged nightly agitprop shows for the public. After two months of occupation, heavily armed police finally forced them out earlier this week, although some artists are still camping outside the building. Carla Camurati, director of the Cultural Olympiad, is putting on a brave face. She admits they have had to scale down their plans because of the cuts - but says the events will still go ahead. When I ask her why there is no information anywhere, she says: "There will be lots of surprise events, they're not advertised in advance. "They will be spontaneous and outside in the streets." When I press her for more details, she says there will be flash mobs, dancing, street theatre and literary events, adding: "We have the weather for it, unlike London, and we should make the most of that." Under a circus top in the centre of the Rio, I find one of Brazil's top theatre directors Renato Rocha. In the background, a group of teenagers are swinging from trapezes or walking on stilts. Rocha worked for a long time with the pioneering theatre group Nos do Morro - based in a Rio favela, as hillside shanty towns are known - which aims to transform young lives through the arts. He also brought a group of youngsters to London 2012 to take part in the World Shakespeare Festival, organised to coincide with that Games. But Rocha says when he applied to stage a circus show in Rio during the Cultural Olympiad, he was told there was no money to fund it. The artistic director of Rio's opening ceremony, taking place next Friday, says it will cost 90% less than Danny Boyle's critically acclaimed extravaganza which kicked off London 2012. Brazil's answer to Boyle is Fernando Meirelles who directed the Oscar-nominated film City of God, set in Rio's slums. Meirelles famously cast his actors from the inhabitants of a real favela - using Rocha's theatre group to help him. It changed their lives and many went on to have successful careers. Image caption The London 2012 opening ceremony - but what will Rio's festivities be like? Despite the secrecy surrounding the opening ceremony, Meirelles is thought to be doing the same with the actors, dancers and musicians taking part in his Olympic show. I've been told passinho - a new dance craze sweeping through favelas which combines breakdancing with funk and samba - will be a key feature of the opening ceremony, but other details are scarce. Meanwhile, the artists who are occupying the Ministry of Culture have vowed to stage a series of "spontaneous protests" during the Olympics. But they won't give out any details of their plans - just like the Cultural Olympiad, "it's secret". 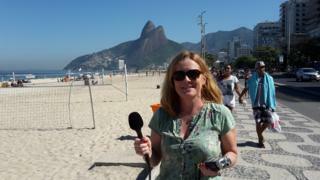 Front Row from Rio is on BBC Radio 4 on 29 July at 19:15 BST.